In this topic you will learn how to create a video clip using the Live module. For recurring events: If during the 24 hours after an event the event is reactivated, the clipping will only be available for the content of the most recent event. There will be no way to create clips from the prior event, even if it's under 24 hours after the last event was deactivated. Clips will be frame-accurate provided that the encoder is sending SMPTE timecodes for the stream. Clips with a start time less than 10 seconds into the stream cannot be created. Clips cannot be created from encrypted live streams. To open the clip editor, open the Live module, click on an event name and then click Create Clip in the left navigation. The clip editor will open. Note that all times in the clipping interface are based around the UTC time that the video data was received by Brightcove. This is a necessary adjustment to account for streams that have exceeded the VOD window (run more than 24 hours). When a video has exceeded that window, the time we get back from the player can no longer reliably be used to generate clips. When creating clips, the highest quality rendition from the selected Live Ingest Profile is used as the source for the clip. The default uploading ingest profile for the account is used when creating renditions for the clip. Clips are segment accurate only. Follow these steps to create a clip. Using the clipping buttons or shortcut keys, set the start and end points for the clip. Enter the clip video properties. Any required custom fields will also be displayed. (Optional) Expand the Advanced Options. 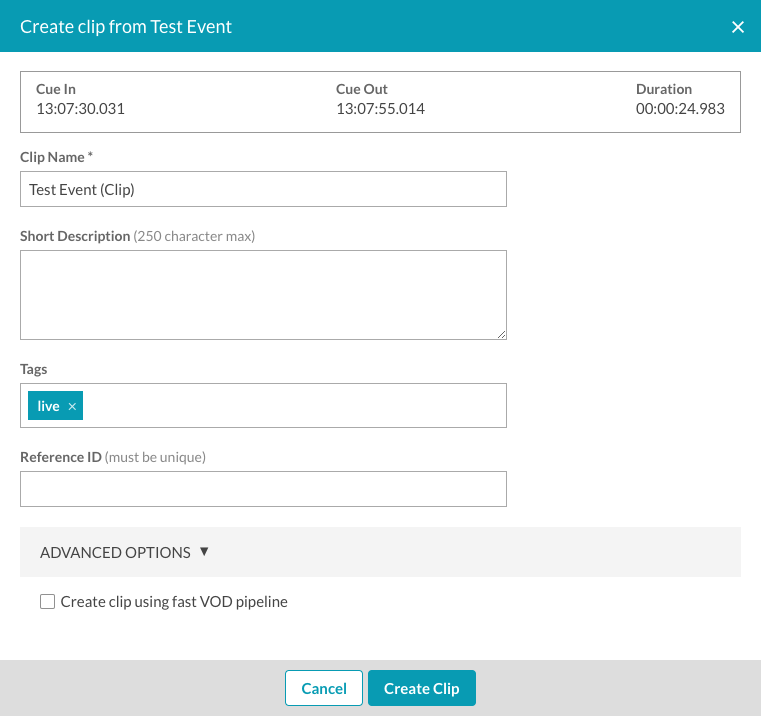 Enabling Create clip using fast VOD pipeline will minimize the time it will take for the clip to be ready for playback. This option uses the segments from the live stream for fast playback at segment-accuracy, while simultaneously doing a frame-accurate transcode. Once the frame-accurate transcode is complete, it will replace the segment-accurate fast renditions. Be aware, though, that Fast VOD clips will be segment-accurate, not frame-accurate. Note: When using this option, the default ingest profile for uploading must be a Dynamic Delivery profile or the clip creation will fail. Click Create Clip. The transcoding process for the clip will begin. Clips are transcoded using the default ingest profile for the account. A list of all clips will appear below the clip editor. Clicking the Clip Name will open the clip in the Media module in another browser tab. Click Publish to Social to open the clip in the social module to publish it to a social media account. For information on publishing videos using the Social module, see Publishing Videos to Social Media Platforms. The preview player is used to preview the clip. When the event is in progress and the clip editor is opened, the clip will begin to play from the "safe live point" which is approximately 3 segments before the end. Note that not all browsers support autoplay. The playback control buttons are used to control to playback of the clip inside of the preview player. The clip time displays the current UTC time for the playhead and the clippable time. Clicking on the UTC link will switch to the local time display. The clipping buttons are used to clip the desired portion of the source video. Sets the starting point of the clip. The start point can also be set by dragging the handle at the beginning of the focus timeline. Sets the ending point of the clip. The end point can also be set by dragging the handle at the end of the focus timeline. The cue in and cue out points are the start and end of a clip. Each of these points is represented on the focus timeline with a draggable handle, and the time between the points is filled-in green. The points are also represented in the context timeline as the left and right edges of the green rectangle indicating the clip space. Click the preview clip button to play the clip. The playhead is an indicator of where in time the player is playing. The playhead is represented in the focus timeline by a red line with a red circle on top and with a red vertical line in the context timeline. On the focus timeline, the playhead may be dragged to scrub through the video. Double-clicking on the focus timeline will move the playhead to that point. The playhead can also be used to set cue in and cue out points using the cue-in/cue-out buttons or by using the keyboard shortcuts. The focus timeline is the top timeline in the interface. The playhead is an indicator of where in time the player is playing. The playhead is represented in the focus timeline by a red line with a red circle on top. The context timeline is the bottom timeline in the clip editor. 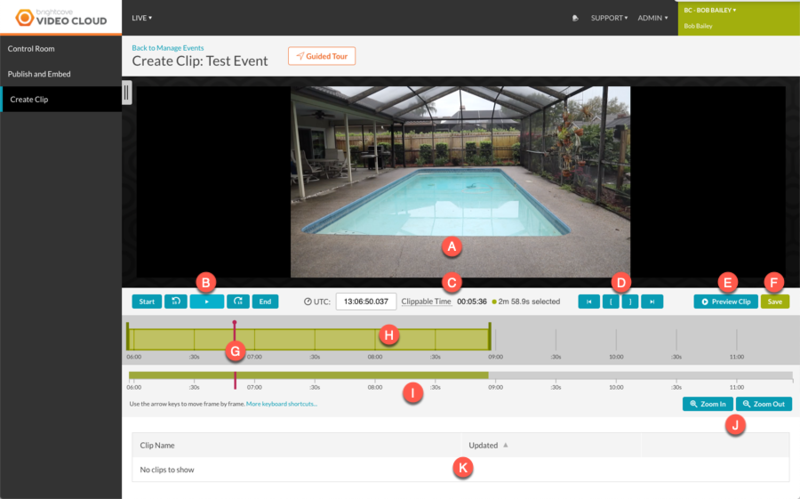 The context timeline shows the entire duration of the video, regardless of zoom level, the selected area of the clip, the location of the playhead, and the current focus viewport. The timeline is indicated with a red line. The zoom buttons are used to zoom in or out on the focus timeline. Zooms in the focus timeline. The focus viewport (white box) in the context timeline will show the area of the clip that is being displayed in the focus timeline. Zooms out the focus timeline. The focus viewport (white box) in the context timeline will show the area of the clip that is being displayed in the focus timeline. A list of clips will appear below the clip editor. Click Publish to Social to publish the clip to one of your social destinations using Brightcove Social. For information on publishing videos using the Social module, see Publishing Videos to Social Media Platforms. Keyboard shortcuts can also be used to play and create a clip from the video. The following keyboard shortcuts are available.